Note: stamps described as "purple" are today very often found looking more brown in colour due to oxidisation. 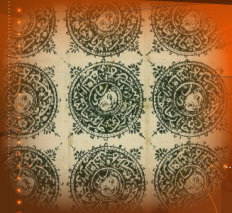 Stamps dated 1292 (= 1875-76) Plate made up of 5 Abasi and 10 Sanar types. Printed in Purple, SG 20-21. The last position on the sheet has a wider outer circle.